What do you do when you confront someone with their false doctrine and Bible twisting and they accuse you of being a Pharisee? You need to hear this segment of the Fighting for the Faith Radio program about those who play the Pharisee Card. After my meeting with Rick Warren I had decided that I would be commenting and critiquing some of the content that he taught at the Purpose Driven conference. I still intend to do that. However, after seeing the 'fire storm' that was created after I publicly thanked Rick Warren for his generosity and for being a gracious host it became sadly clear that there is another issue that must be addressed. The battle for truth or the 'truth war' as some have called it, has taken a bad turn. Some segments of the battlefield have degenerated into ad hominem bickering and biting and toxic vitriol. This is not what Christ has called us to. In fact, that behavior is contrary to the clear teachings of scripture which call us to defend the faith with 'gentleness and respect'. Anyone who knows me knows that I have a deep passion for the gospel and I will arm wrestle anyone in order to make the case that the message of 'Christ crucified for our sins' should be the central message of all of our sermons, lessons, studies, books and devotional material and many of you who read this blog and follow my public teaching share that same passion for the gospel. What I find ironic almost to the point of irreconcilable contradiction is that there are some that claim to share a passion for the gospel yet they employ the most demeaning and vicious forms of personal slander and ad hominem attacks in their "defense of the gospel". I don't see how this contradiction is even possible because the gospel message is the good news of how "God so LOVED the world" that His only begotten Son died for my sins and yours on the cross and thereby reconciled us to himself in one supreme act of LOVE. Furthermore, God has entrusted us with this message of reconciliation. 2Cor. 5:18 All this is from God, who through Christ reconciled us to himself and gave us the ministry of reconciliation; 19 that is, in Christ God was reconciling the world to himself, not counting their trespasses against them, and entrusting to us the message of reconciliation. I know that I have been guilty of the very behavior I am decrying in this post and I am deeply sorry for committing this sin and repent of it. That being said, I am appealing to all of my Christian brothers and sisters who have a passion for defending the truth and defending the gospel to repent of ad hominem and personal attacks and let your actions and statements and debates always be seasoned with love, compassion, gentleness and respect. Contrary to what you may think, love, gentleness and respect do NOT compromise the Gospel. Instead, love, gentleness and respect are the fruits of the gospel in our lives and they only make our defense of the truth even stronger and more convincing. In fact, it doesn't matter if your theological precision is accurate to one one hundredth of a percent and all of your apologetic arguments are irrefutable. Attacking and demeaning and belittling are not actions that are in keeping with the gospel. In the days ahead I will be posting my Biblical critique of the material I heard at the Purpose Driven conference. I am not doing this in order to personally attack Rick Warren, nor am I interested in slicing Rick Warren up into little pieces so that I can feed him to a hungry school of 'theological pirana'. Instead, I will be posting these critiques as part of an ongoing debate and dialog. The debate and dialog is necessary so that we can all wrestle with the scriptures, defend the gospel, identify and correct error and build people up in the truth. The saying is true, "History never repeats itself but it rhymes". Today we are again locked in a critical battle and what is at stake is the very message of the gospel and by extension the souls of men. Eighty-four years ago J. Gresham Machen found himself locked in a battle that is very similar to the one we find ourselves in today. The forces arrayed against God's word and the gospel were the theological Liberals. Today we are contending for the faith against the same errors introduced by the Liberals. But these errors and heresies have morphed, like a deadly virus, into the Emergent Church movement as well as popular manifestations of the Mega-Church Movement. Therefore, it is important that we go back to the beginning of Liberalism and acquaint ourselves with the battles that were fought nearly a century ago. In so doing, we will be better prepared and equiped to fight that battles that lay ahead. I've created an electronic book version of Machen's seminal work entitled "Christianity & Liberalism". This book is free for the download. But, if you would like to support this work then you can do so by clicking here. Please download, read and liberally share this important book. Today is the 490th anniversary of the Reformation. Sadly, the church in America is in need of Reformation just as much as the medieval church. This video shows the abuses of the Catholic church through the selling of indulgences. This spurned Martin Luther to pen the 95 Theses. Indulgences are every bit as evil as the counterfeit "prosperity" gospel of Joel Osteen and the TBN crowd, the counterfeit Emergent church, as well as the counterfeit "informercial" gospel being passed off by the purpose-driven seeker-sensitive types. This is a must hear podcast! In it you will hear a comprehensive rebuttal to the claims of the Discovery Channel documentary The Lost Tomb of Jesus. This podcast hits the movie's evidence “head on” and shows how the film maker's Statistical Analysis, DNA evidence, and assumptions when weighed critically do not prove that the Talpiot Tomb is the family tomb of Jesus of Nazareth. The evidence that is evaluated in this podcast comes from the movie, the book "The Jesus Family Tomb", the discovery.com website, and the Jesusfamilytomb.com website. Please share this podcast with your friends, family, fellow believers and skeptics. The PowerPoint slides for this podcast are available by clicking here. Academy Award winning director James Cameron and Emmy Award winning investigative journalist Simcha Jacobovici have joined forces and produced a documentary film claiming to have identified the tomb and physical remains of Jesus of Nazareth. The show is entitled “The Lost Tomb of Jesus” and it airs on March 4, 2007 on the Discovery channel. In short, the bodily resurrection of Jesus Christ is the central pillar of proof put forward by the New Testament authors to substantiate Jesus’ claims to deity and the forgiveness of sins offered to humanity through Jesus shed blood on the cross. The Apostle Paul argues that If Jesus didn’t bodily rise from the dead then Christianity is a FALSE religion and should not be followed or observed. Although the film hasn’t aired, there is enough ‘evidence’ posted on the internet already to begin drawing conclusions. In 1980 a tomb was discovered in Talpiot inside of modern Jerusalem that contained 10 stone ossuaries (bone boxes). Six of the ossuaries had names carved on them identifying the occupants. At first glance these names have a striking similarity to the names of people from the New Testatment. Although critics are already pointing out the fact that these names were very common names for people who lived in and around the holy land during the 1st century, Simcha and Cameron’s documentary uses DNA evidence and statistical analysis in order to draw the conclusion that this is Jesus’ family tomb. They claim that the odds of it not being Jesus' tomb are HIGHLY improbable. Click Here to Watch Simcha’s ‘Football Field’ Analogy. Taken at face value Simcha and Cameron appear to have built a rock solid case against Christianity. However, if you spend even a little time critically analyzing their claims then you realize that Cameron and Simcha have done nothing more than build a Da Vinci Code like house of cards that crumbles as soon as you blow on it. The film’s statistical analysis is its strongest proof for the Talpiot Tomb being Jesus' family tomb . HOWEVER, in order for their statistical interpretation of this evidence to be true we must assume five things about the occupants of the tomb. These assumptions in some cases require us rewrite history or subscribe to an 'alternate history'. Here are the five 'alternate history assumptions' that must be true in order for the film's statistical analysis to have any weight or merit. 1. We must assume that the Jesus and Jose of this tomb are brothers. Why? Because if they are not brothers then the statistical chance of this tomb being THE tomb of Jesus of Nazareth becomes VERY low. 2. We must assume that Mariamne is Mary Magdalene. The statistical case for the Talpiot tomb being Jesus' family tomb almost totaly hinges on this assumption. The evidence put forth by the filmmakers to support this assumption is a 4th Century Gnostic text entitled “The Acts of Philip”. But as you will see later in this article there is absolutely no chance that the Mariamne in the Talpiot tomb is Mary Magdalene. Not only is the Acts of Philip a non-credible source for supporting their claim. The film's producers actually ignore one of their own expert's findings regarding the name inscribed on Mariamne's ossuary. 3. We must also assume that Jesus of Nazareth was married to Mariamne and together they had a son named Judah. Again there are no credible 1st Century documents that support this assumption. This assumption is more akin to the Da Vinci Code than sound historical and archaeological scholarship. 4. We must assume that the Matthew found in this tomb was somehow related to Jesus’ mother but is NOT her son. We have no documentary evidence of a Matthew in Jesus’ family. Therefore, the filmmakers have to find a way to ‘explain him away’. His presence in the Talpiot tomb messes up their theory that this is Jesus’ family tomb. So they had to fabricate a theory that would explain his presence. The filmmakers also have to explain why certain people are missing from the tomb. This leads to the next assumption. 5. We have to assume that the James ossuary originated from this tomb even though there is no solid evidence that links it to this site. This is critical because if this tomb is Jesus’ family tomb, then three of Jesus’ brothers are inexplicably missing from this site. They are James, Judas and Simon. The filmmakers go out of their way to attempt to prove that the James ossuary belongs to this tomb because that reduces the number of missing brothers to only Judas and Simon. Click here for more information on the James ossuary. "Former FBI agent Gerald Richard testified that a photo of the James ossuary, showing it in Golan's home, was taken in the 1970s, based on tests done by the FBI photo lab. The trial resumes tomorrow. Jacobovici conceded in an interview that if the ossuary was photographed in the 1970s, it could not then have been found in a tomb in 1980." The end result of all of these assumptions is the family tree/tomb inhabitants chart shown below. This chart is taken from the films official discovery channel website. 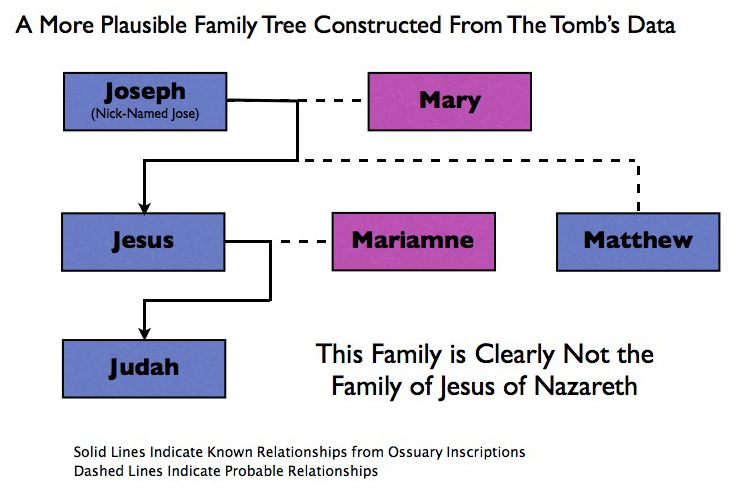 Please notice that this chart is still unsure as to how Matthew and Mariamne are related to the other inhabitants of the tomb. The reasons for this uncertainty is twofold. First, the presence of Matthew and Miriamne do not fit the written records of Jesus' family. The second is a direct result of the DNA evidence collected by the filmmakers. In other words, the ONLY THING the DNA evidence proves is that the Jesus and Mariamne found in this tomb are not maternally related. The film's producers argue that this proves that Mariamne was married to Jesus. But, it is entirely possible that she could have been the wife of Jose, Judah or even Matthew. Why There is Absolutely NO Chance that Mariamne is Mary Magdalene. In order to make the claim that Mariamne is Mary Magdalene the film’s producers have literally had to manufacture evidence and ignore practically every established rule that relates to historical evidence and primary source documents. The ONLY way the film’s producers could build their case is by setting aside the eye-witness testimony of the New Testament Gospels which never once refer to Mary Magdalne as Mariamne. They instead favor an obscure 4th century gnostic document called the Acts of Philip in order to make their claim that Mary Magdalene and the Mariamne of the Talpiot Tomb are one in the same. By doing this, the film’s producers are literally expecting us to believe that a document written nearly 300 years after Jesus and Mary Magdalene walked the Earth is MORE credible and MORE accurate than the New Testament documents which were written by eye-witnesses VERY shortly after the events they record. Furthermore, if you actually take the time to read the Acts of Philip you will notice some very funny things. The first thing you'll notice is that the book itself very fanciful. The book’s narrative claims that Jesus sent out a group of followers to spread his message. The followers were Philip, Bartholomew, and a woman named Mariamne who is identified as Philip's sister. Among their accomplishments was the conversion of a talking leopard, a talking goat, and the slaying of a dragon. Yes, that is right Bartholomew, Philip and Mariamne went out preaching Jesus’ message to talking leopard’s and talking goats! Secondly, the Acts of Philip NEVER even ONCE refers to Mariamne as Mary Magdalene. 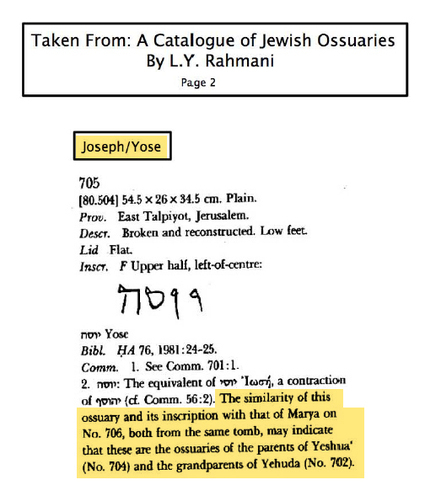 Granted, some scholars speculate that Mariamne COULD be Mary Magdalene BUT the text never actually says that. Therefore, the film’s producers are literally overstating the evidence supplied to us in the Acts of Philip. Furthermore, the film’s producers contradict their own expert L.Y. Rahmani when they claim that the inscription on Mariamne’s ossuary says “Mary the Master”. According to the film’s own evidentiary documents which are available for download from the Discovery.com website, the name on Mariamne’s ossuary literally reads “of Mariamne who is (also called) Mara (Mara is a contraction of the name Martha)” Click Here to download the document yourself and read the second page of the Catalogue of Jewish Ossuaries by L.Y. Rahmani. In the notes you will see what the film’s own expert says that ossuary says. One last point, the film claims that "Maraimne e Mara" means Mary the Master. But the only way they could make this claim is if they mix languages. Mara means master in Aramaic, but the ossuary incription is written in Greek. In order for the film makers to be correct abou the ossuary text reading “Mary the Master” we have to believe that the inscription although written in greek is supposed to be understood as being half greek and half Aramaic. This is preposterous. Since the inscription is in Greek, if it was supposed to say "Mary the Master" it would have to say "Mariamne Ho Kurios" NOT "Mariamne e Mara". No matter how you slice it, the fact remains that there is no possible way to link Mary Magdalene and Mariamne e Mara from the Talpiot tomb. The film’s producers are either being naive or intellectually dishonest by claiming that they are one in the same person. Another linch pin in Cameron’s and Simcha’s statistical analysis is the assumption that Jose is the brother of Jesus. If the Jose of the Talpiot Tomb is Jesus' brother then the statistical case for this tomb being the tomb of Jesus of Nazareth is much stronger. If Jose is not Jesus' brother then their statistical case case begins to crumble. This leads us to ask an important question... Why should we believe that the Jose found in this tomb is the brother of Jesus? The evidentiary documents provided by the filmmakers themselves say that Jose is Joseph and that he is most likely the father of Jesus and the grandfather of Judah. This is not my speculation, this is the testimony L.Y. Rahmani who is one of the film's own experts . Below I am reproducing a screen shot taken from the documents provided by the filmmakers. Click Here to download the document for yourself. Fact: the evidence provided by the filmmakers themselves lead us to conclude that Jose (Joseph) of the Talpiot tomb is the father of Jesus NOT his brother. As you will see later, this will have a profoundly negative impact on the film’s statistical analysis. With this evidence in mind, below you will find a more plausible reconstruction of the family tree of the Talpiot Tomb’s inhabitants. Notice that this family looks a lot different than the family of Jesus of Nazareth. Not only is this a more plausible reconstruction of the family tree for the inhabitants of the Talpiot Tomb, it PERFECTLY fits the evidence that the tomb itself presents us as well as the expert opinion of L.Y. Rahmani. In this reconstruction, Joseph, whose nickname is Jose is present in the tomb along with his wife, two of his sons, Jesus and Matthew, his daughter-in-law Mariamne and his grandson Judah. In short, Simcha and Cameron are engaging in the archaeological equivalent of ‘identity theft’ by trying to force the evidence into proving that this is the tomb of Jesus of Nazareth. Although Jesus of Nazareth had a father named Joseph, he did not have a brother named Matthew, nor was he married, nor did he have a son. If we had found Jesus’ family tomb we would have found his brothers James, Jose, Simon and Judas along with his father Joseph and his mother Mary. The reason James, Simon and Judas are missing is quite simple, they are not buried there because this is not their family’s tomb. The film's statistical underpinnings also collapse as soon as you properly consider the tomb’s evidence. The film claims that the probability of the Talpiot Tomb being Jesus’ family tomb is 600 to 1 or 599 times out of 600 it would be Jesus’ Family tomb. The way they came up with that figure is by determining a probability for each of the names mentioned in the tomb then multiplying those probabilites by each other then adjusting the figure for unintentional biases and all possible first century tombs. Since neither Matthew nor Judah were ‘explicatively’ mentioned in the Gospels they did not use their probabilities in the statistical analysis. Here are the probabilities that the filmmakeres came up with for each person found in the tomb. The combined 'raw' probability of all of these people appearing in the same tomb is 1 in 2,400,000. They then divided 2,400,000 by 4 to adjust for unintentional historical biases and were left with 1 in 600,000. They then divided 600,000 by 1,000 to adjust for all possible first Century Jerusalem Tombs. Their final figure was 600 to 1 in favor of it being Jesus Tomb. Yet, notice that they removed Matthew and Judah because they were not ‘explicatively’ mentioned in the gospels. Yet, they are keeping Mariamne in their formula despite the fact that she is also NOT ‘explicatively’ mentioned in the gospels. This is the equivalent of ‘cooking the books’ with bogus data. Since I've already shown that there is absolutely no way to equate Mary Magdalene with Mariamne we can remove Mariamne from the statistical equation. Let’s see how that affects the results. After adjusting for unintentional biases and all possible First Century Jerusalem Tombs the probability of the Talpiot Tomb being Jesus’ family tomb is only to 3.8 to 1. When you consider that Jose is probably Jesus' father Joseph, then we realize that he is already accounted for in the formula for Jesus. Remember that the probability of 1 in 190 was for Jesus son of Joseph. If we were just accounting for Jesus then then the formula would only be 1 in 8. Therefore, Joseph should not be counted twice in this equation. When you change the equation accordingly and adjust it for biases, the statistical chance that the Talpiot Tomb is the THE tomb of Jesus of Nazareth falls even further to ONLY .19 to 1. In other words, there is a greater chance that the Talpiot tomb ISN'T the tomb of Jesus of Nazareth than it is. Simply put, the REAL statistical probability that this is the tomb of Jesus of Nazareth is so slim as to be thoroughly unconvincing. There is a better chance that Hilary Clinton will join the Republican party than this grave site being the actual tomb of Jesus Christ. These more accurate figues also show us that statistics are only as good as the assumptions that you are operating with. Faulty or biased assumptions can skew and distort statistical results so badly that those results can be misleading or untrue. This is why Mark Twain reminds us that there are three types of untruths: "Lies, Damn Lies and Statistics". Now it is time to have some fun. Since Simcha and Cameron are defending the film’s conclusions based upon its statistical ‘soundness’, let's test their assumptions using their same statistical methods. Assumption 1 - That the Jesus and Jose of the Talpiot Tomb are brothers. 1 in 3 chance they are brothers. Assumption 2 - That Mariamne in the Talpiot Tomb is the Mary Magdalene of the New Testament Gospels. 1 in 1000 chance she is. Assumption 3 - That Jesus of Nazareth was married to the Mariamne of the Talpiot Tomb. 1 in 1000 chance that he was. Assumption 4 - The Matthew found in the Talpiot Tomb is related to Mary but is NOT her son. 1 in 10 chance that he is. Assumption 5 - The James Ossuary is originally from the Talpiot Tomb. 1 in 2 chance that it is. When we calculate the statistical probability that all five of these "alternate history assumptions" are true the raw score is a 1 in 60,000,000 chance that all five are true. When we adjust the probability for unintentional historical biases and all possible first century Jerusalem tombs we are still left with a 1 in 15,000 chance that all five of the films assumptions are true. In other words, 14999 times out of 15,000 Simcha’s and Cameron’s assumptions regarding the alternate history that is necessary to conclude that the Talpiot Tomb is that of Jesus Christ will be false. A careful analysis of the facts proves that Simcha and Cameron have NOT found the 'lost tomb' of Jesus of Nazareth. Their 'evidence' is far from conclusive and their statistical analysis is mired by faulty assumptions and bad scholarship. Simcha and Cameron’s efforts, although they make for provocative television do not even meet the minimum standards of evidence necessary to overturn the Biblical record. Contrary to what Simcha, Cameron and their liberal theologians would have you believe, the evidence for Jesus' bodily resurrection from the dead as laid out by the eye-witness testimony of the New Testament documents still stands. --- Update February 28, 2007 - 10th Ossuary Was NEVER Missing. The case against the Cameron’s and Simcha’s claims is picking up even more steam and I’ve had to adjust the probability of the the James Ossuary belonging to the Talpiot Tomb. The film is claiming that the James Ossuary more than likely originated from the Talpiot Tomb because one of the 10 original ossuaries disappeared and is missing. According to Simcha the James Ossuary first surfaced in 1980, therefore it must be the missing Talpiot ossuary. Yesterday, the Jerusalem Post published an interview with Prof. Amos Kloner. He is the man who oversaw the archeological work at the Talpiot Tomb in 1980. He was asked directly about the “missing ossuary” and the chances that the James Ossuary originated from Talpiot. Kloner told the Jerusalem post that there NEVER was a missing ossuary and that the JAMES ossuary does not fit the dimensions of the ossuary in question. What of the assertion that the 10th ossuary disappeared from your care and may be none other than the "James" ossuary? Nothing has disappeared. The 10th ossuary was on my list. The measurements were not the same (as the James ossuary). It was plain (without an inscription). We had no room under our roofs for all the ossuaries, so unmarked ones were sometimes kept in the courtyard (of the Rockefeller Museum). As a result of this new information we could justify raising the probality of Assumption 5 from 1 in 2 to a higher figure such as 1 in 10 or even 1 in 100. If we go with the more conservative figure of 1 in 10 this raises the probability that all five of the films alternate histories is true to 1 in 75,000.